The Pray For The Wicked Tour brings theatrical pop rock sensation Panic! 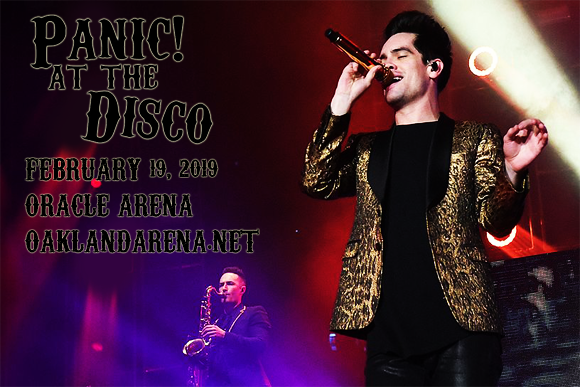 At The Disco to Oracle Arena on Tuesday 19th February 2019 for one hell of a show! Performing from the band's newest album, also called Pray For The Wicked, Brendon Urie and his dazzling crew will create a party like no other, and they will also be joined for the evening by up-and-coming singer-songwriter Two Feet! Panic! At The Disco is an American rock band, best known for the hit singles “Death of a Bachelor”, “I Write Sins Not Tragedies” and “High Hopes”. Formed in 2004 in Las Vegas, Nevada by childhood friends Ryan Ross, Spencer Smith, Brent Wilson and Brendon Urie, the band was signed to Fall Out Boy bassist Pete Wentz's Fueled by Ramen imprint label Decaydance Records December of that year. The following year brought the release of their debut album, A Fever You Can't Sweat Out, which was well received both critically and commercially, and was eventually certified double-platinum. The band has experienced a number of changes in both personnel and musical direction throughout its six-album career, and as of 2015 its only official member is lead singer and songwriter Brendon Urie. Pray For The Wicked is Panic! At The Disco's most recent studio album, released in 2018.